This piece is the second of a series of staff reflections from the learning exchange between partners in Nepal in May 2018. The photography featured in this blog was done by Geet Sharma of fotocause.org. When I started at Thousand Currents (formerly IDEX) twelve years ago, one of the first partners I learned about was Women Awareness Center Nepal. They had just initiated a partnership with Thousand Currents, and my younger self was intrigued and inspired by WACN’s organizing strategy to build a collective asset fund through cooperatives that would provide Nepalese women with economic autonomy. My knowledge of WACN’s work grew; their large network of cooperatives focused on powerful collective money saving was a shining example of alternative economies that relied solely on women’s resources. 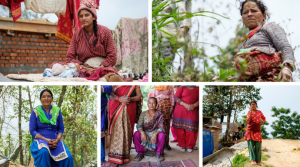 Today, WACN works with 41 cooperatives with many having more than 1,000 women members, mobilizing up to 500 million Nepalese rupees – that is over US$4.5 million dollars! That in itself is an amazing triumph. At Ghimire Gau village in the Kavre district, we met with the Punyamati Nari Chetana Cooperative that has 110 cooperative members, of which 92 are savers. The challenges shared with us were very similar to what I’ve heard from women in El Salvador, Guatemala, Mexico and Peru. These challenges included: domestic violence, not having financial independence from men, not being able to send their children to school, and being burdened by household chores. WACN supported these women in starting a group for savings and loans. To make these groups more sustainable, the strategy was to establish a cooperative. The cooperatives required a monthly meeting, where the women would decide how to invest their resources. Yet, the women also used these meetings to share problems and progress with each other, and exchange ideas and wisdom. The women started to organize to see how they could improve livelihood conditions in their community. This was common to hear from our group visits, where women shared the different community activities they had implemented. Examples included creating a campaign to end child marriages, preservation of water resources, and improving infrastructure for roads. One story shared was how women members used their increased, collective confidence to inquire how the Village Development Committee was using the budget for women’s issues. They soon realized that that budget was being used for men. As a result, the women vocalized their demands for a women’s budget and started attending the council’s meeting to influence those programs. In another visit, where cooperative members of the Namuna Nari Chetana cooperative were most impacted by climate change-related drought, the women organized their savings to build water tanks that supply 10 families each. The water tanks also helped with seed production, providing 500 to 1,000 saplings to grow each season. This has led to seed exchanges, and improved organic agricultural practices such as making bio-fertilizers and compost. Together WACN, women’s cooperatives, and other local organizations have built at least 14 community centers to house offices for the cooperatives and income-generating projects. These centers also offer meeting spaces and serve the community. We had the opportunity to visit one of them in the Kavre district. At this center, computer and accounting training was being offered to 30 members to document their cooperative and become more efficient. One cooperative member manages a tailoring store for women who want to purchase clothing. The staff also runs a women’s clinic once a week providing holistic care that includes family planning, regular check ups for women, and counseling. They refer patients to a hospital if they see any situations as critical. The most exciting project the staff shared was the creation of a candy factory. Cooperative members had brainstormed what type of collective enterprise they could experiment with that used local fruits (such as hog plum) and herbs. They decided they would make flavorful treats to sell, and could employ 10 to 12 women to support this project. Last year, they successfully sold 2,100 kgs (4,630 pounds) to the community. What was evident in our visit with WACN was the impact of the 2015 earthquake, where about 9,000 people were killed, many thousands more were injured, and more than 600,000 structures in Kathmandu and other nearby towns were either damaged or destroyed. One cooperative shared how they immediately organized trauma and healing therapy to support women who had lost tremendously in this tragic event. They were ready in that moment to provide emergency relief and in the aftermath, provide loans for construction of houses. Yet, another cooperative had a hard time to reconstruct their homes, as we sat underneath a tin roof, which they had received from the government as temporary shelter. It had been three years since the earthquake, and this house had not been able to transition into a permanent housing infrastructure. Yet, the women kept on meeting because these spaces – however temporary – were valuable for them. “We are getting a say, and making decisions. We are happy to meet every meeting to share our experiences,” one member shared. We visited a cooperative with Dalit members, and we asked them how they were able to build their cooperative. At the beginning there were only three members, and in fact it was difficult to find members to join. However, they made a collective effort to add one member each month, until they eventually got to the 500 members they have today. They use their meetings to talk about the rights of Dalit women, the value of inclusion, and being active members in the communities. They felt strongly in their equal right to have access to economic opportunities and to make behavioral changes in their communities. If your agenda is to support women’s leadership, how are women showing up in your organizational infrastructures? Are they decision-makers? Or are they just participants of your activities? This moment reminded me of all the testimonies we heard among WACN’s membership that highlighted the incredible courage and boldness that women in Nepal demonstrate on a daily basis. Not only are these women taking steps to find and use their voice and build their confidence, they take the extra steps to find ways to improve and take care of their families and communities. But their journey does not stop there. They push themselves to take the extra and harder step to voice out the injustices and offer an alternative way of living and thinking… the proposal of living in a society where equity, justice and opportunity exists for everyone. In Nepal and around the world, this is how I see Women Power show up.